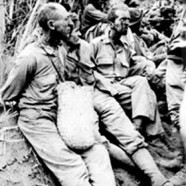 The Japanese landed troops on Luzon on December 10 and 12, and on Mindanao, in the southern Philippines, on December 20. At the time of the invasion, MacArthur’s troops numbered some 31,000 well-trained forces composed of both American and Filipino (12,000 of the men were the crack Philippine Scouts) in addition to a largely reserve, poorly trained, and poorly equipped Philippine army of approximately 100,000. The Japanese plan had been to take the Philippines in fifty days. While the Allied forces were ultimately defeated, ‘the valiant American defense of Bataan held up Japan for several months, ‘one historian notes, a delay that “may have . . . saved Australia”. The evacuation to Bataan, which one observer said “looked like a small Dunkirk”, has been described by historians as a minor miracle, strategically important in delaying the Japanese advance throughout the western Pacific by several months. “MacArthur’s forces executed the . . . movement with masterly skill . . . By this decision and movement, MacArthur averted immediate defeat [and] delayed the Japanese timetable by four months. 1. William Donovan, M.D., POW in the Pacific, Memoirs of an American Doctor in World War II (Delaware: Scholarly Resources Inc. 1998), 2-3. 3. Gavan Daws, Prisoners of the Japanese, POWs of World War II in the Pacific (New York, William Morrow and Company, Inc. 1994), 67. 4. William Donovan, M.D., POW in the Pacific, Memoirs of an American Doctor in World War II (Delaware: Scholarly Resources Inc. 1998), 17. 5. Richard C. Mallonée, The Naked Flagpole: Battle for Bataan, ed. Richard C. Mallonée (San Rafael, CA: Presidio, 1980) 84. 6. Jonathan M. Wainwright, edited by Robert Considine, General Wainwright’s Story (New York, Doubleday & Company, Inc. 1946), 133.